Although all of his nine siblings were born in Beeston, John Samuel Turton was born in Lenton, Notts in 18872, the third child, second son of John (b. 1864, Nottingham) and Mary Elizabeth (b. c1863, Beeston née Hazzledine). John worked in the lace trade as a warper and, in 1901, was living with his wife and nine of their children at 4 Greyhound Yard, an area of poorer housing off the north side off High Road, adjacent to the inn of that name3. John junior, then aged 14, was living at West Gate, Chilwell, Notts as a domestic servant to William Baker, a retired farmer and his wife Mary4. In the next few years, tragedy hit the family when, first John died, aged under 40, in 1902, followed three years later by his widow, aged about 42. Two of their children also died, Herbert in 1901 and Nellie in 1902, which left eight siblings to continue their lives together. In 1911, they were all living at 40 Upper Regent Street, Beeston with the eldest, Mary Harriett, the notional head of the family. John Samuel was then aged 24 and was working as a moulder and foundry labourer5. In 1913, John married Rose Hannah (or Rosanna) Perks6 who had been working in Beeston as a domestic servant for the family of Owen Sutton, the butcher who lived and traded at 51 Wollaton Road, Beeston. Their son, John Turton was born in December 19137. Although we have no evidence of the date, it seems that John Samuel had enlisted with the Grenadier Guards sometime before Britain declared war on 4 August 1914. Mobilisation began immediately and Private Turton left Chelsea Barracks with 2nd Battalion Grenadier Guards and arrived at Le Havre, France on 15 August as part of the 4th (Guards) Brigade of the 2nd Division, a component of the British Expeditionary Force8. The Division was soon engaged in several of the actions on the Western Front. At the First Battle of Ypres in October/November 1914, the battalion suffered huge casualties, such that only 4 officers and 140 men remained, although contingents of reinforcements continued to arrive to replace the losses. In August 1915, the battalion was transferred to the 1st Guards Brigade of the Guards Division. At some point too, Private Turton was transferred to 3rd Battalion which had arrived in France in July and became part of the 2nd Guards Brigade although, as the two battalions were involved in much the same actions throughout 1916 and 1917, his subsequent involvement can continue to be tracked. Interestingly, 2nd battalion was joined at the front on November 20 1915 by Winston Churchill who had recently resigned from the Government and taken the rank of Major9. The Battle of the Somme had begun disastrously on July 1st with great loss of life, and this continued in actions throughout the remainder of the first phase in July and throughout August. It was against this background that both battalions were assigned to the The Battle of Flers–Courcelette, the next phase of the Somme battle, which began on the 15th September 1916. Despite inevitable casualties the action overall was a tactical success and was quickly followed up by the Battle of Morval which began on the 25 September. In September as a whole, the German armies on the Somme lost about 130,000 casualties, bringing the German Empire closer to military collapse than at any time before the autumn of 1918. However, the arrival of winter with mud, rain and snow brought desperately difficult conditions with only occasional action. However, German forces were planning a withdrawal to new positions on the shorter, more easily defended Hindenburg Line, about 25 miles narrower and to the rear of their previously held position. During fighting in February and March 1917 - which involved both Guards battalions - the withdrawal was successfully carried out and British patrols probing German outposts found them unoccupied. In preparation for the withdrawal, the enemy had destroyed the abandoned area - railways and roads had been dug up, trees felled, water wells polluted, towns and villages destroyed and a large number of mines and other booby-traps had been planted. This destruction and a well-prepared rear-guard, slowed the possibility of immediate follow-up and allowed the withdrawal to be completed in an orderly way. When it was complete, the British found themselves facing a far more formidable German defensive position than they had after the Somme battles, as the enemy once again occupied all the higher and more strategically important positions, overlooking lower ground on which the Allies had to dig in and attack from during subsequent actions in the area. In the summer of the 1917, a series of battles which together made up the Third Battle of Ypres began with the Battle of Pilkern in which the Guards battalions were involved. After this finished on the 2nd August, 3rd Battalion, along with others were billeted in camps in the Ypres salient involved in preparation work for future actions. On 4 September, the battalion moved to Eton Camp which was tented and close to the railway and as a consequence there was considerable bombing by hostile aircraft and there were 40 casualties10. It is likely that, after surviving over three terrible years of action, Private Turton was one of those who were wounded. He died of his wounds on 12 August despite the best efforts of the staff of the dressing station situated in a nearby farmhouse at Canada Farm. 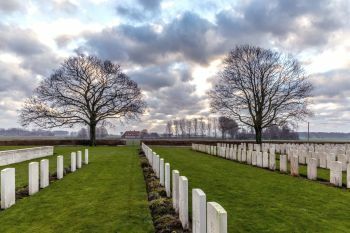 Private Turton was buried in Canada Farm Cemetery which is located 8.5 kilometres north-west of Ypres. It took its name from the farmhouse used as a dressing station during the 1917 Allied offensive on this front. Most of the burials are of men who, like Private Turton, died at the dressing station, between June and October 1917. There are 907 First World War burials in the cemetery. Private Turton was posthumously awarded the 1914 Star, the British War Medal and the Victory Medal11. Rose, his widow was paid his financial effects of £14 3s 7d, on behalf of herself and their son John, in two installments on 29 January 1918 and 25 February 1918, She also received his War Gratuity of £18 on 28 September 191912. At the end of the war, Rose was living at 4 Alexandra Cottages, Villa Street, Beeston and, for a short time, took a job at Beeston Foundry. She later moved to 16 City Road, Beeston13. She died in 1970, aged 8414. John's elder brother, Thomas William Turton, served with the South Staffordshire Regiment and died of wounds on 31 May 1918. 2His birth was registered in Nottingham Registration District (of which Lenton was part) in Q1/1887 (Ref 7b 243). Although his name was registered as 'John Samuel', his name is sometimes stated as 'John Sidney' on later records. 8Details of the deployment of 2nd and 3rd Battalions of the Grenadier Guards are from the Forces War Records website (www.forces-war-records.co.uk/units/347/grenadier-guards). John's early attachment to 2nd Battalion is based on his medal card on which this is recorded along with his embarkation date of 13 August 1914. 9This is recorded in the battalion war diary on that date. A transcript of the diary is at https://3rdgrenadierguardsww1.wordpress.com. 10Based on entries in 3rd Battalion's war Diary. 11Details from John's Medal Card and Medal Rolls - available on ancestry.com. 12Details of the payments are from the "Army Register of Soldiers' Effects, 1901-1929" - available on ancestry.com. The amount of the gratuity tends to confirm Richard's enlistment date of August 1914. 13The Alexandra Cottages, Beeston address is included in John's CWGC documentation and the 1921 Electoral Roll. Rose is recorded at the City Road address in the 1930 Electoral Roll. 14For some reason, she died in Newark Registration District in Q1/1970 (Ref 3c 745). She was cremated, probably at Wilford Hill Crematorium, on 27 February 1970.